Where Does Tom Hardy’s Head Go Inside Venom? It isn’t always a smooth transition from comic book to movie. What works on the page may not necessarily work on the screen. And that is the situation we seem to face with this new Venom movie, based on the popular Spider-Man villain of Marvel Comics. 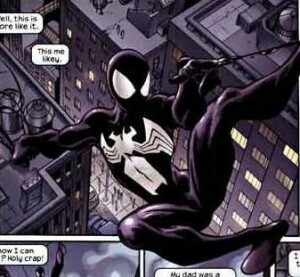 When Spider-Man wears the symbiote, it looks like a sleek black version of his standard costume. Attached to Eddie Brock, it turns into something more monstrous, with a gaping maw and razor-sharp fangs. And the upcoming Venom movie does a pretty faithful job of recreating his classic look (created by Todd MacFarlane, and then refined by artists like Erik Larsen and Mark Bagley). Here Venom’s face is at least 70 percent mouth. The distended mandible is so gigantic it practically starts at the top of his head. At the back corner of the mouth there’s a bunch of symbiote strands connecting the top and bottom jaws, but you can still practically see clear through Venom’s cheek all the way to the night sky behind him. And nowhere in there do we see even a hint of Tom Hardy. Where did he go? The prevailing theory on the internet about Eddie Brock’s disappearing head inside Venom’s gigantic mouth is that a symbiote’s head is basically hollow. Venom is this big hulking brute, far bigger than ordinary human Eddie Brock, and so Brock is sort of floating inside his big mass, with his head actually somewhere inside Venom’s chest. You don’t see Eddie when Venom opens his mouth because he’s down below. After the symbiote covers the rest of Hardy’s face and a quick cut to black, Venom lunges at the camera, giving us a shot right down his throat. Hardy has completely vanished. He was right there a second ago! In a comic, it’s easier to dismiss these sorts of issues as quirks of anatomy or illustration. In flesh and blood and CGI symbiote, it’s a little bit trickier. (This also speaks to the difference between a two-dimensional drawing and a three-dimensional image.) I guess it’s possible that in that split-second cut to black, Tom Hardy’s head dips down inside Venom. But that raises more issues. Is Tom Hardy scrunched up at the bottom in the fetal position? Just how cramped is it inside the Venom suit? Is it super uncomfortable, like the row of seats on an airplane that don’t recline? Is he constantly moving up and down in that thing? This seems like a really poor way to go through life lethally protecting people. There’s one other possibility: The symbiote of the comics has some camouflage and shape-changing abilities. When Peter Parker wears it, it can morph to look like his street clothes, or help him blend into his surroundings and effectively turn invisible. So conceivably Venom could camouflage something while it sat inside its mouth and make it look like there’s a big hole where, in fact, there’s actually This Means War star Tom Hardy. Whatever the reason, I accept this explanation because otherwise I will literally think about this every single time Venom is onscreen in this movie and I don’t need that. Okay, so now that that’s settled let’s move on to the next Venom question: Why is he talking about turds? Is the symbiote made out of turds? Source: Where Does Tom Hardy’s Head Go Inside Venom?